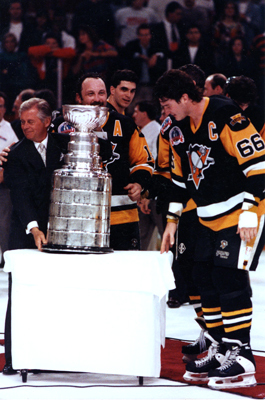 Mario Lemieux's crowning achievement was the two Stanley Cups he brought to the city of Pittsburgh. Many great players have called the Igloo home over the past 49 years, including National Hockey League Hall of Famers such as Ron Francis, Paul Coffey, Joe Mullen and Larry Murphy, to name a few. However, nobody can match the wizardry Mario Lemieux performed between 1984 and 2005. While we can all look back today on Lemieux’s legendary career and marvel at the numbers he posted – 690 goals (ninth all-time), 1,723 points (seventh all-time) and, most importantly, two Stanley Cup championships following the 1991 and ’92 seasons, those closest to Lemieux were able to appreciate his greatness from the minute he first stepped onto the then-Civic Arena ice during training camp in 1984. Lemieux turned out to be more than special – he became the greatest talent to ever play the game. He burst onto the scene with 43 goals and 100 points during his rookie season, earning rookie of the year honors, and beginning a stretch which would see him join Wayne Gretzky as the only players in NHL history to record 100 or more points in each of their first five seasons. It didn’t take Lemieux long to earn the hearts of the Penguins faithful. As Lemieux turned the Penguins from bottom feeders to the league’s elite, he did so with an impeccable ability to rise to the occasion when the Penguins needed him the most. Who will ever forget his series-defining goal against the North Stars in the 1991 Stanley Cup Final when he split Minnesota blueliners Neil Wilkinson and Shawn Chambers before tossing a backhander behind Jon Casey as he spun to the ice? That goal will be replayed on highlight reels as long as hockey is played. During Game 2 of the 1992 Final Lemieux allowed the Penguins to emerge victorious in what most hockey experts consider the greatest game ever played at Mellon Arena when he threw the rebound of a Larry Murphy shot behind Chicago’s Ed Belfour with just 12.5 seconds remaining in regulation. That tally allowed the Penguins to complete a 5-4 comeback, fueling Pittsburgh’s Stanley Cup repeat. 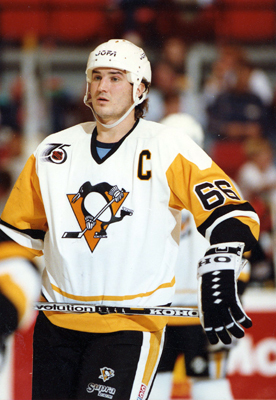 Not only did the Penguins learn to expect the dramatic from Lemieux, they also had the chance to witness firsthand his uncanny ability to make all the players around him that much better. Nobody knows that better than Rob Brown, who scored 49 goals and 115 points playing alongside Lemieux in 1988-89, and is still considered the one player who thought the game on the same rarified level Lemieux did. “He can make anyone look good,” Brown said. “When you play on a line with superstars, you have to be able to think the way that they do. Mario saw the game differently than anyone else. He saw plays that were about to happen and potential passes before anyone else. I think you have to get into their mind and play the way they think. Obviously you don’t have the skill level to do it, but if you have the mental capacity to see what he sees, that makes it much easier. Mario Lemieux scored some of the most dramatic goals of his caeer at the then-Civic Arena during the 1991 and '92 postseasons. Goals and assists were Lemieux’s forte, but in an ironic twist it’s a save that will be Lemieux’s lasting legacy in Pittsburgh. We all forget how close the Penguins were to leaving the city after the team went bankrupt in 1998. Nobody was willing to step forward and help ease the team’s credit issues when Lemieux, who was just one year into his first retirement, stepped forward. Not only did he purchase the team and keep it in Pittsburgh, he worked hard over the next 10 years to ensure a new state-of-the-art facility for the Penguins – the Consol Energy Center. Leave it to Lange, who had the privilege to call nearly every Lemieux goal at Mellon Arena, to best put his accomplishments into the proper context.